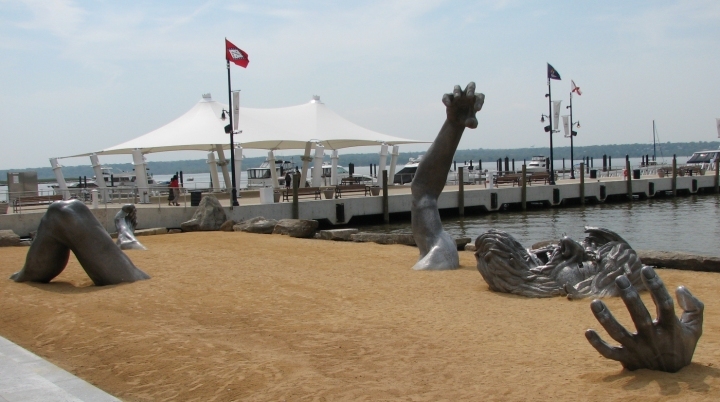 The Awakening is a 100-foot statue of a giant embedded in the earth, struggling to free himself, located at National Harbor in Prince George's County, Maryland, just outside the District of Columbia. The statue consists of five separate aluminum pieces buried in the ground, giving the impression of a panicked giant trying to pull himself to the surface. The left hand and right foot barely protrude, while the bent left leg and knee jut into the air. The 17-foot right arm and hand climb above the observer while the bearded face, with the mouth in mid-scream, struggles to emerge from the surrounding earth.